This year is going to be a huge one for the Air Jordan 6. Three out of the five original colorways of the sneaker have been confirmed for a retro release (the “Carmine”, “White/Infrared”, and “Sport Blue”) and the other two are hanging out in the limbo of the rumor mill for the time being. Letting you get a crack at all those without the wait for retros is this incredible restored set. 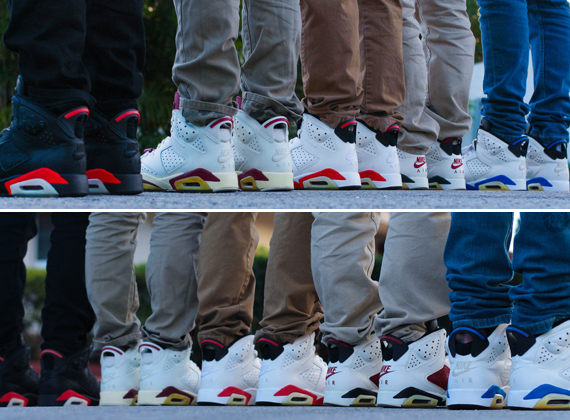 The group features all five of the aforementioned pairs in various restored and sole-swapped conditions. The price isn’t cheap, but this is an opportunity to grab a (sorta) OG set in one fell swoop so you’ve got to expect to pay a pretty penny. Continue reading to see these restored Air Jordan 6s and then take a look at the price put on them by resurrectedsoles on eBay.